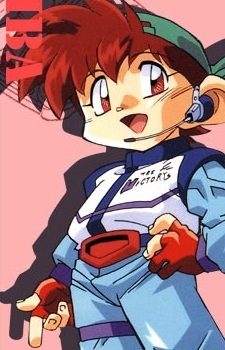 Retsu is one of the two title characters. He is a fifth-grade student who is 11 years old, and Go's older brother. Although he is able to control his patience better than his brother, he still lets out his annoyance with someone once in a while. Retsu sports a green hat as his trademark. His primary color is red, which is the color of his hair, eyes, gloves, shirt, and Mini 4WD cars. Together with Go, they are known as the "Let's Go Brothers" (レッツゴー兄弟 Rettsu Gō Kyoudai). In WGP, he is the captain of the TRF Victorys. Cars: Sonic Saber (ソニックセイバー Sonikku Seibā), Vanguard Sonic (バンガードソニック Bangādo Sonikku), Hurricane Sonic (ハリケーンソニック Harikēn Sonikku), and Buster Sonic (バスターソニック Basutā Sonikku), and Blitzer Sonic (ブリッツァーソニック Burittsā Sonikku).